Whitewash -- (common use) 1 pk. lime, plenty of water to slack it. When hot with slacking, stir in thoroughly about a half pound of tallow or other grease and mix well. Then add hot water enough for use. 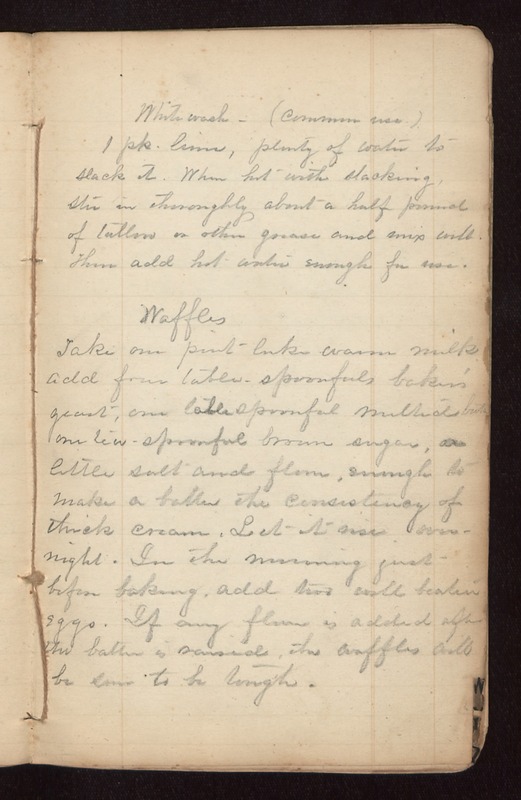 Waffles Take one pint luke warm milk add four table-spoonfuls baker's yeast, one tablespoonful melted butter one tea-spoonful brown sugar, a little salt and flour, enough to make a batter the consistency of thick cream. Let it rise overnight. In the morning just before baking, add two well beaten eggs. If any flour is added after the batter is raised, the waffles will be sure to be tough.